The NJ Horseplayer is as eager as ever for this Saturday's Simulcast Series Challenge (#3) at Monmouth Park, but perhaps more anxious to hit the road to attend opening day at Keeneland next Friday. By virtue of my top-20 finish in SSC#2 on March 2, I have already locked up a berth in April's SSC Invitation at Monmouth, where the top two of 60 qualifiers will win berths to the National Handicapping Championship in Las Vegas next January. That gives me the option to play a little more fast and loose in SSC#3, but it's too early to discuss and I'll save writing a preview for later this week, once I've had an opportunity to sift through past performances for Saturday's card (Aqueduct, Gulfstream and Tampa). Considering I have never been to Keeneland Race Course, it's not too early to solicit ideas for what I and my two kids should do during our maiden visit only 10 days away. So, what should the NJ Horseplayer contingent do? The caravan (not the minivan variety -- I'm Volkswagen diesel all the way) makes its first stop at about our halfway point -- Pittsburgh, PA, where we'll devour some Primanti Bros. sandwiches in the original Strip District location, maybe hit Deluca's for its buckwheat pancakes, ride the Duquesne Incline and shiver our way through a Pirates day game vs. the Cubs. Then we hit the road for Lexington. Rain, snow or shine, we've got our grandstand tickets already for fabulous Keeneland and plan on arriving early just to stroll the grounds and take in the beauty. From there, it's anyone's guess, and I could really use help for "must visit" eateries and attractions from people who've been before. Or, if anyone has contacts and can hooks up up with something unique, I'm all ears. If the weather allows, we'll head up to Cincinnati for Saturday's Reds game before heading back to NJ, but I'm open to sticking around the Keeneland area if there are things we absolutely should do in our short stay. Please use the comment field below to offer your suggestions. Any and all are welcome. 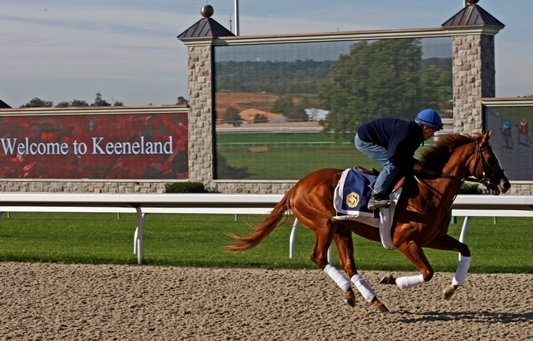 Go to Paceadvantage.com and Derbytrail.com and do a search for keeneland, i'd guess you will find the answers there. GL and have a great trip. Travelled to Lexington 12 years in a row from Long Island. Great Venue for Racing. Tailgating with great horse fans, who travel from surrounding States. Make sure you try the BURGOO(Stew) . Sold at every foodstand in Keeneland. Always stayed at Hilton Lexington on the Green, attached to Nicholasville Rd. Mall.